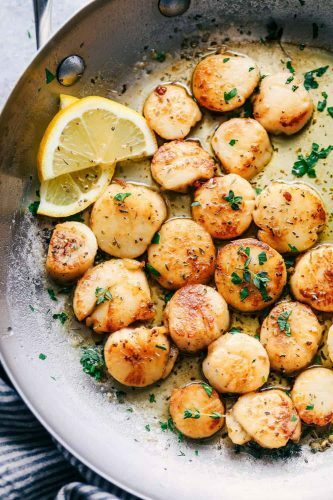 Garlic Butter Herb Scallops are pan seared and have the best buttery garlic herb sauce. This is a quick and simple meal that tastes straight from a restaurant! 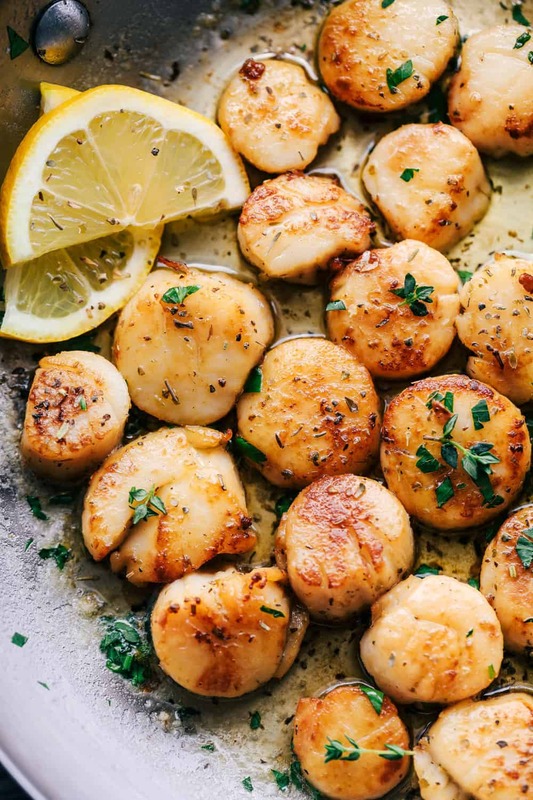 If you looking for another amazing scallop recipe, be sure to check out these Pan Seared Scallops with a Lemon Caper Sauce! I have finally lost all of my baby weight. It has been a pretty hard journey especially when you are such a foodie like me. I LOVE food! But my baby turned 10 months and summer is just around the corner and I knew that I had to get serious. Since this baby is the caboose, I knew that it was the last time I would have to lose the baby weight. It is always so hard! But let me tell you. The results are totally worth it. I will be sharing my journey and pictures with you shortly. I am convinced that if I can do it, anyone can! Fish, seafood, turkey, and chicken have been a huge part of my diet lately. I recently was introduced to scallops. They were incredible! They are often described as similar to crab or lobster, but more firm. Their flavor tends to be sweet and delicate, but it’s the texture that really makes them interesting and enticing. When cooked correctly, they are soft and chewy but not rubbery or tough. 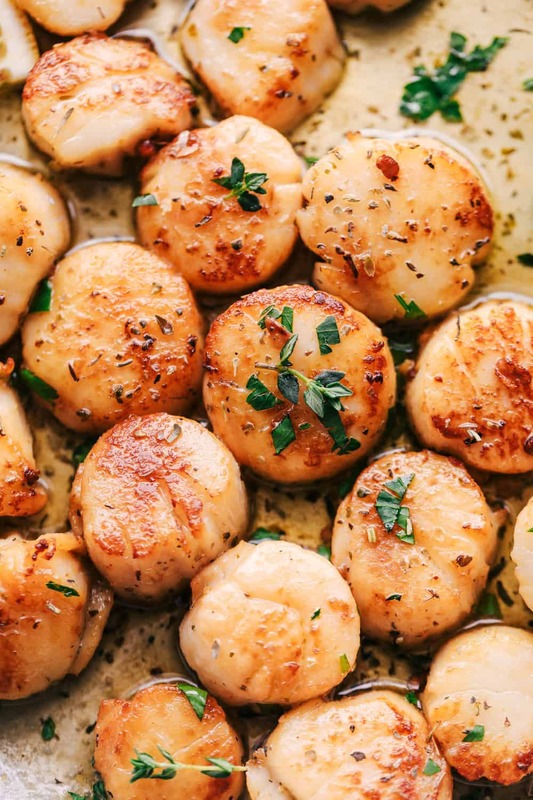 Scallops are 80 percent protein. They are also a good source of magnesium and potassium. How do I make seared scallops? Add olive oil to a skillet and turn to medium-high heat. Salt and pepper the scallops and add to the heated pan. Sear the scallops 3-3 1/2 minutes or until the sides are golden brown. What side dishes can I serve with scallops? In a medium-sized bowl combine salt and 1 cup hot water, stirring to dissolve the salt. Add ice water to cool the brine. Add scallops to the brine and let stand for 10 minutes. Line a sheet pan with paper towels and set aside. Drain the scallops, rinse under cold water, and then arrange in a single layer on the paper towel-lined sheet pan. Place another paper towel on top of the scallops and gently pat scallops. Remove as much surface moisture as possible for the best browning results when cooked. In a medium-sized skillet over medium-high heat, add the oil and let heat until it starts to smoke. Salt and pepper the capers and add to the skillet. Sear scallops for 3- 3 1/2 minutes on each side until they are golden brown on each side. Remove from the pan and set aside on a plate. Add the butter, garlic, and fresh herbs. Saute for 1-2 minutes and add the scallops back to the pan and heat through. Garnish with lemon and fresh chopped parsley on top. I think I need to introduce my family to scallops! We love crab and these seem so much easier! Thanks for sharing this recipe! Looks delicious! Where is the nutritional information for each recipe posted? I love scallops. I have never tried them in a brine first. Will be now!! In step 3 you mention capers? Looking forward to trying this recipe. Sounds yummy. Only one critique. Please could you include the nutritional information along with your recipes ? I cook with your recipes and suggestions all the time, but usually end up going online to find a similar recipe ( I use yours, it is only for reference ) so that I can get a caloric value. That’s it. I enjoy your blog immensely, not only your recipes, but also your prose. And I don’t plan on deserting you, just a curiosity. Thanks for giving us all these wonderful flavors. I like to use skinnytaste.com or myfitnesspal.com for any nutritional information. Hope you find what you are looking for. Can’t wait to try these. I’ve never had scallops with these particular herbs. And like Rachel, I’ve never thought about brining them. Could you provide an amount for the capers? Thanks for your wonderful recipes! The capers are for your preference.